NY Times' "What's Up Next in NY: Airbnb and Rent Regulation"
Meanwhile, New Yorkers living in the city’s nearly one million rent-stabilized apartments should brace for a fight in Albany in June, when the rent-stabilization law expires. Housing advocates hope to see a reversal of a rule that allows landlords to deregulate vacant units if the rent reaches $2,500 a month. Over the past 20 years, at least 133,000 units in the city have gone market rate because of this rule, according to the Rent Guidelines Board. If the trend continues, rent stabilization could be further weakened, undermining Mayor de Blasio’s efforts to preserve affordable housing, say supporters of the policy. One suggested change: require rent-stabilized tenants to verify their income. This website's editorial comment: That suggestion (apparently by big real estate interests) for changing the rent laws would require rent-stabilized tenants to verify their income. But income is irrelevant to keeping New York City's stock of affordable housing by repealing vacancy deregulation. Some 95% of apartments that are de-regulated lose their protection when they are VACANT - so the tenants' income has nothing to do with it. Only about 5% of rent stabilized apartments are de-regulated because the household income is $200,000 or more AND the rent is at least $2500. In any event, the median income for rent stabilized apartments is roughly $39,000/year. Check out the excellent video of the Bill Moyers show, The Long, Dark Shadows of Plutocracy. He links together the super-tall towers, like private safe deposit boxes for oligarchs, and the shadows these investment properties cast over Central Park and the 40 million New Yorkers who use it yearly. There are clips from interviews with Jaron Benjamin, former head of Met Council on Housing, and State Senator Liz Krueger (among the good folks), and State Senator Martin Golden (among the baddies). First in the nation - if it passes. This bill builds on a concept presented earlier by NYS Chief Justice Jonathan Lippman. Council Member Mark Levine has proposed a bill to pay for lawyers in housing court for low-income tenants. Currently, 90% of tenants in Housing Court have no lawyer, while 90% of landlords have one. Guess who wins. Many families are made homeless by court eviction. Homelessness costs the City an enormous amount (over $3,000/month for shelter). That doesn't count the obvious costs to those suffering homelessness, including extra travel to get the kids to their regular school and to get to work, mental and physical ailments requiring treatment, and more. Landlords whose business plan includes trying to evict many tenants at once may well be dissuaded when they know that the tenants will be represented. So paying $2000 for a private lawyer could save the City many thousands of dollars. And it's the right thing to do. About 60% of tenants in Housing Court are within those income levels according to C.M. Levine. Many groups are working together to repeal vacancy deregulation, to reduce or end the bonus landlords get when they re-rent a vacant apartment, to limit Major Capital Improvement increases, and more. (See the legislative program.). Work with those groups, AND express your individual voice on the matter by clicking here. Because of vacancy deregulation, New York has lost more affordable housing than it can build in the near future. Some 90% of apartments taken out of rent control or rent stabilization are deregulated because they are VACANT. (Only about 5% are deregulated because of the tenant's income.) In fact, the median income for a rent regulated family in NYC is about $39,000 a year. Ending vacancy deregulation will end landlords' incentive to get tenants out - and reduce harassment. Ending vacancy deregulation will mean fewer families become homeless. to have the family members living with them for years get the apartment if the primary tenant leaves. And under those bills many apartments would be re-regulated. Nat'l Low Income Housing Trust Fund comes to pass! Fund (CMF). At long last, the NHTF will be funded. poverty in the United States. New York State's highest court has ruled that a tenant in bankruptcy need not sell her rent stabilized lease back to her landlord to raise money for the tenant's creditors. The NY Times has covered this: Rent-Stabilized Leases Shielded in Bankruptcy. Judge Sheila Abdus-Salaam wrote the Nov. 20, 2014 decision that the tenant could not be forced to give up her home and sell her rent stabilized lease to the landlord. Relying on a state law that exempts "public assistance benefits" from being seized by the bankruptcy trustee, Judge Abdus-Salaam said that rent stabilizes leases are such a benefit. Tenant activist Khadijah Canns discuss the future of rent regulation. are below a goodly amount. preferential rents, illegal fees, and more). Divided by a Windfall: Southbridge (former Mitchell-Lama) residents are the topic of a NY Times article. development in Coney Island that privatized in 2007.
apartments deregulated under vacancy deregulation if rents are below a goodly amount. Close the loopholes that make affordable apartments unaffordable (Major Capital Improvements, Individual Apartment Improvements, preferential rents, illegal fees, and more). Keep illegal hotels - including AirBnB - from depleting our stock of affordable housing. at City Hall. Click here for a flyer in Word - so you can add your group's name. 27% of the apartments (instead of 20%) will be affordable. Union members will build, maintain and service the project. Meanwhile, the developer is chasing out rent regulated tenants in his Brooklyn building. JOIN TENANTS, ADVOCATES, AND ELECTED OFFICIALS FOR A RALLY AND PRESS CONFERENCE TO URGE ALBANY LAWMAKERS TO STRENGTHEN THE RENT LAWS WHNE THEY EXPIRE IN JUNE 2015! Click here for a black and white flyer in Word format. Click here for a color flyer in pdf format. Rent Laws Expire in June - so Tenants Need . . .
Albany term. In June the rent laws expire and must be renewed. Will they be weakened or strengthened? The Nov. 4th ballot contains three proposals for approval or rejection by the voters of New York State. Please note that the three proposals are on the back of the paper ballot, so you need to turn it over to vote on them. The following is a description of the proposals, with a recommendation from Tenants PAC on how to vote on Proposal 1. The proposed amendment to sections 4 and 5 and addition of new section 5-b to Article 3 of the State Constitution revises the redistricting procedure for state legislative and congressional districts. The proposed amendment establishes a redistricting commission every 10 years beginning in 2020, with two members appointed by each of the four legislative leaders and two members selected by the eight legislative appointees; prohibits legislators and other elected officials from serving as commissioners; establishes principles to be used in creating districts; requires the commission to hold public hearings on proposed redistricting plans; subjects the commission's redistricting plan to legislative enactment; provides that the legislature may only amend the redistricting plan according to the established principles if the commission's plan is rejected twice by the legislature; provides for expedited court review of a challenged redistricting plan; and provides for funding and bipartisan staff to work for the commission. Shall the proposed amendment be approved? Tenants PAC urges you to vote NO. While this constitutional amendment put forward by Governor Cuomo and the legislative leaders in Albany sounds good on the surface, it contains loopholes that would allow the legislature to do what it does now: draw super-partisan district lines to protect incumbents and to protect the majority parties from having to face competitive elections. A state supreme court justice forced the NYS Board of Elections to delete the word “independent” in the above language describing the proposal, ruling that the proposal could not be called independent from the state legislature when the legislative leaders appoint the members of the commission, and because the commission must submit its proposed lines to the state legislature for approval. This is a cynical power-grab in the name of reform, and is opposed by editorial boards all over the state as well as by numerous civic groups including Common Cause New York, NYPIRG and EffectiveNY. No fake reform – vote NO. Crains New York: Cuomo's biggest donor is also the oldest. In the run-up to Tuesday's balloting, Gov. Andrew Cuomo's re-election campaign collected $45 million, almost double what it raised four years earlier. But one key factor in that success, and the source of the largest slug of cash, stayed constant: the legendary—now 100-year-old—real estate magnate Leonard Litwin. Limited-liability companies connected to Mr. Litwin's real estate business, Glenwood Management, gave Mr. Cuomo's campaign $1 million in this election cycle—three times the size of the second-ranked donor's contribution, according to data compiled by the New York Public Interest Research Group. In addition, Mr. Litwin gave, in total, almost $500,000 to the state Democratic Party and to Kathy Hochul's campaign for lieutenant governor. Click on the link for the rest of the article. The election is tomorrow, Tuesday, November 4. Tenants PAC strongly urges a vote to re-elect Attorney General Eric Schneiderman and a vote to re-elect State Comptroller Tom DiNapoli, both of whom are great supporters of tenants and tenants’ rights. Tenants PAC has made no endorsement for governor. Tenants PAC also urges a NO vote on Proposal One, a constitutional amendment put forward by Governor Andrew Cuomo and the legislative leaders that claims to create a non-partisan system for redrawing legislative district lines beginning in 2022. In fact this is a fake reform proposal that would actually enshrine in the state constitution the ability of the legislative leaders to draw hyper gerrymandered lines in order to protect their majorities and protect incumbent legislators. The foxes that run the hen house called Planet Albany will do whatever they can to persuade voters that this is a good plan, but it is fatally flawed. Vote NO. (The proposals are on the back of the ballot.) No fake reform! It is not too late to make a contribution to Tenants PAC to help elect our six priority candidates for New York State Senate. Just this week we have made an additional $3,300 in donations to two of them, and we want to do more by the weekend. The hope for a Democratic majority in the State Senate rests on the outcome of these six races, all of which are competitive and could go either way. All six of our candidates are solidly pro-tenant. The NYC real estate industry is pouring money into five of these races to help the Republican candidates. We thank those of you who helped us meet our latest $1,000 match; the response was swift and much appreciated. We urge everyone to dig deep into your pocketbook and give again, or give for the first time if you have not yet done so. The stakes are enormously high. Tenants PAC, 277 Broadway, Suite 608, New York NY 10007. Or you can make a secure on-line donation at www.tenantspac.org. Contributions to Tenants PAC are not deductible from federal income tax. ONE DAY TO GO TO THE STATEWIDE ELECTION. If you have a car, please fill out the form on the above link. Saturday, November 1 or Tuesday, November 4.
someone to pick you up at the Metro North station. If you have a car, please let Andrew know. Greater NYC for Change, VOCAL-NY & other groups. of dollars to defeat our candidates, and the outcome on Tuesday could be good or bad. ReDistricting affects Tenants: Don't dilute our power! On the ballot Nov. 4 is a redistricting amendment to our state constitution that would worsen an already flawed system for drawing state legislative and congressional districts. I'll be voting "No" on Proposal 1. Here's why. For decades, legislators have been able to draw districts to their own specifications, even going so far as to carve out the block where a potential challenger's home is located. Instead of allowing voters to choose their representatives, elected officials have chosen their voters. That's gerrymandering at its worst: an undermining of competitive democracy that protects incumbents and invites political complacency and even, in some instances, corruption. Prop 1, as the redistricting amendment is called, purports to create a bi-partisan commission that "establishes principles to be used creating districts" and will "hold public hearings on proposed redistricting plans." The intent sounds good but the reality is the opposite. The state Legislature can still reject any and all recommendations from this commission. In other words, the amendment is an easily manipulated mechanism for perpetuating the current system instead of reforming it. It's no wonder the State Supreme Court ruled against the "independent" ballot language for this amendment. Come for the terrific workshops, breakfast, lunch, and community - all free. It's a terrific resource! The rally at noon had terrific music and chants, and good speakers, including Congressman Charles Rangel who compared 80% market rate-20% affordable apartment buildings to hospitals in which only 20% of the room were for sick people. Several speakers called for the repeal of vacancy decontrol - since allowing landlords to de-regulate vacant apartments depletes New York City's stock of affordable housing and motivates the harassment so many tenants suffer. Riverside Edgecombe Neighborhood Association, Tenants & Neighbors, and We Act, among others. Saturday, Oct. 25 - Tenant March!! Why is electrical submetering "additional rent"? to the amount each uses, based on a remotely-read meter in each apartment. In buildings that are heated by electricity, the electric bills can be enormous - particularly where the tenants cannot control how much heat they are getting and the buildings are not energy efficient. Where tenants can't pay their electric bills, should they face a cut-off of electricity (as would happen if they had a direct contract with Con Ed), or will they be evicted? The state's housing agency has a standard lease that lets landlords evict tenants. That should be changed. Read excerpts from a FEDERAL (as opposed to STATE) court that just dismissed a case on technical grounds that Yonkers Riverview tenants brought against the federal government's HUD and the NYS Homes & Community Renewal (formerly DHCR) about submetering evictions. Ending rent hikes and tenant harassment resulting from loopholes in rent stabilization (repeal vacancy decontrol and bonuses, end MCIs, and make preferential rents permanent). Ending Homelessness in NYS by investing in long-term rental assistance programs. Investing in affordable and resident-run housing programs. #TenantTuesday and Tuesday lobbying trips to Albany. 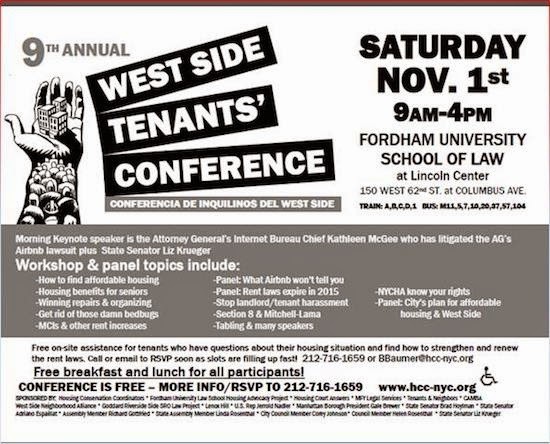 Check out the NY Tenants Together calendar on the right side of this page. Click here - and join one of these groups to get stronger and protect all our rights! This website includes links to many tenant resources as well as selected email postings from aff-hous@googlegroups.com, and information from the now-defunct website www.save-ml.org about Mitchell-Lama rentals. But this is NOT meant to be legal advice. Please contact your (or your tenant association's) lawyer for that. Contact the website with questions and suggestions. Preparing for NEXT year's Rent Guidelines Board . . .
How NYC Can Solve Its Affordable Housing Crisis by Steve Wishnia, the Gothamist. What New Yorkers Want from the New Mayor: An Affordable Place to Live by Thomas J. Waters, Victor Bach, published by the Community Service Society. Strengthening New York City's Public Housing: Directions for Change by Victor Bach, Thomas J. Waters, published by the Community Service Society. © Susan D. Susman 9/1/2014. Contact sue@janak.org. Simple theme. Theme images by fpm. Powered by Blogger.